We are your source for high quality Renaissance, Medieval, and Fantasy clothing. We have medieval clothing that is great for SCA, LARP, Weddings, Renaissance Festivals, Theater and more! Medieval and Renaissance Clothing is our specialty. We create apparel that will take you back through the ages with timeless grace and beauty. In our medieval and renaissance clothing category you will find men and women's clothing that in everything from jerkins, tunics and surcoats to bodices, chemises and medieval dresses. We have medieval and renaissance shirts and pants that come in a variety of styles, shapes, sizes and colors. 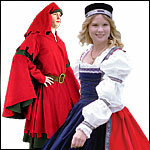 To keep you warm during that cold medieval faire we have medieval cloaks, capes and robes. Arming Wear - Padded garments to wear under your armour. Belly Dance Costuming- Clothing, Belts, Bra Covers, Zils, Ghungroos, Ankle Bells, Hip Scarves & More! Children's Medieval and Renaissance Shirts, Pants, Tunics, Gowns and Surcoats. You will also find our selection of Kid's Headwear including Pirate hats, Princess Hats and Costume Hats. We have Corsets to fit your every desire: Leather, Brocade, Taffeta, Overbust, Underbust! Custom Historical Clothing, Shirts, Pants, Tunics, Gowns, Surcoats and More! Fantasy Clothing and Outfits for Men and Women. Horse Clothing Trappers and Caparisons for your horse. Legends of Sherwood - Throughout the ages, no one character of English folklore has spawned more tales of romance and chivalry than Robin of Locksley, known throughout the realm as Robin Hood. We carry Medieval and Renaissance Shirts for the Event. We have the Celtic Shirt, Renaissance Swordsman Shirt, 15th Century Shirt, Yoke shirts, Pirate shirts and more. Our Mens Clothes section includes Coats, Doublets, Jerkins, Vests, Kimonos. Peasant Outfits - Not everyone wants to be a lord or lady! Pirate Period Clothing - Fine Purveyors of Period Pirate Attire and accessories! WWII Replica Uniforms - A vast variety of authentically correct German and Russian camouflage pattern uniforms from World War II originals.